If you look at the highlighted formatting text you’ll notice that the form is localized (ie.the UICulture is applied) and that the active culture which in this case displays the CultureInfo.CurrentCulture is also set to German. But as you can see the date and number format is clearly using the default en-US formatting. Apparently this is by design in WPF, although I can’t think of a single reason why this behavior should be so. Every other UI environment correctly assumes that if you have your culture set to a specific locale you’ll want your formatting and conversions to apply using this culture. But no that would be, uh too easy and nothing in WPF is easy after all. Well, maybe it is, since the solution is relatively simple. All WPF elements include a Language property that can be assigned and determines the Culture that is used for formatting. The property is applied down the container hierarchy so setting the language at the top level container like the on the Window in the above form is all that’s needed. Easy enough but not something that search turned up real easily. Just another one of those issues I fretted over for a couple of hours experimenting that makes WPF such an incredible time sink. This will switch the default language for the entire application. You’ll want to use this only in startup code as this setting can be applied only once per application. You can still override individual forms when necessary using the explicit language override shown above. Hopefully this will help somebody out by making this issue more readily findable. And no jokes about my funky German localization. Even though I speak German fluently localizing a computer form is definitely not something I feel qualified for :-}. The only point I would make is that numeric date formats should never be used in an international environment. In global terms a numeric only date format like 01/06/2008 is completely ambiguous. It means 6th January 2008 in some parts of the World and the 1st of June in most other parts of the World. Either version of 01-Jun-2008 or Jun-01-2008 is vastly more informative, my preference is to use 01-Jun-2008 as a more acceptable global date format. Of course the month abbreviations must also be translated for internation use. But isn't that the whole point of CurrentCulture? If you have a desktop app and you adjust it to the local culture then the date format (including numeric dates) should make sense, no? It's a different story in Web apps where you are absolutely right because you're not likely to be able to capture everybody's locale accurately. Do like the date format you're proposing as a general rule and we're just giving up 1 extra character for the more readable version. This is a custom date format string right (dd-MMM-yyyy)? 1. Who own the laptop and where was it set up? 2. European employee working in US forgets or does not know that US have a different date format. 3. US employee working in Europe forgets or does not know that UK have a different date format. 4. Variable programming standards, how can we be sure that the local culture is being used. As you said, it is mostly a problem with world wide web applications, but there are destop applications out there that just cannot be trusted. How can an application user be certain? Yes the format used is dd-MMM-yyyy. 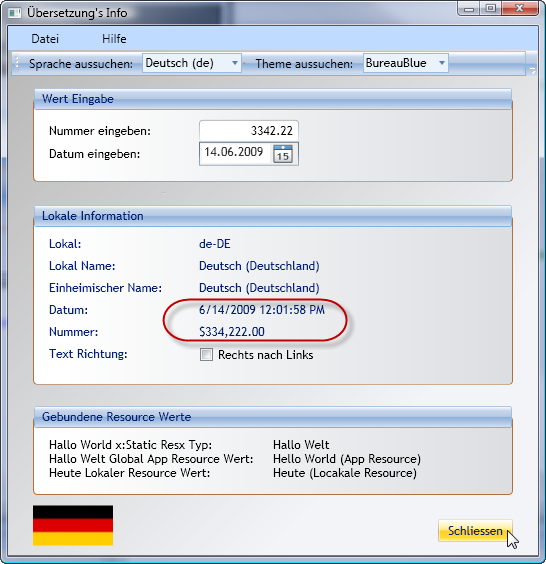 In some countries the official and proper way to display dates is established by law and is important that software follows the law, especially for software used in public service, which happens to be the largest consumers of programs. The fact that WPF's controls don't follow the CurrentCulture is a biggie and is a defect that should be addressed, but as Mr. Strahl pointed out, it's by design, so it's not likely to change (and I would like to choke the guy who decided that, since I had to debug a large app suite that makes use of different programs written in different frameworks, and the WPF ones wouldn't follow what the control panel stated). It's especially annoying the fact that it's only WPF that does that. If all of the controls in the whole .NET framework would do that, it would be one thing, but it's not the case. The points you brought up are user training issues, and shouldn't be addressed by jacking around with the framework. Thought you might wanna know..
Rick, out of curiosity, what is it defaulting to? Your machine's current culture, or the invariant culture? This has always been a sticky situation. I'd almost prefer that there was no default in C# to force developers to always think everytime they emit a DateTime, or if the defaults were to use an invariant culture so that any presentation errors are easily corrected, but config files and other text processing isn't affected, or was already dealt with and doesn't change 'by accident' when switching the regional settings. Like the luddite, I vote to be rid of completely numeric dates altogether. dd-MMM-yyyy is understandable by most. I've been following your difficulties with WPF through your blog but cannot unfortunately help you on the internationalisation; however I would be intrigued to know how you feel the process of development in WPF compares to WinForms/AJAX WebForms - does it actually turn out to be longer to build an application ? For my part, I have consistently found my programming teams take 2-3 times longer to build a WebForms based application than a WinForms based one (even a multi-tier web forms one), just because of the aggravation and "friction" of developing browser based systems. Of course that doesn't mean one is somehow superior as a development paradigm or toolset, but I would have expected a new technique such as WPF (and by extension Silverlight) to close the programmer-efficiency gap. Have you any opinion on whether its made it easier/faster ? @Phillip - at the stage I'm at WPF takes me infinitely LONGER than either WinForms or WebForms. For me Web development and WinForms dev are roughly on par in terms or dev speed are roughly on par with WinForms maybe a little speedier, but it's probably a case where what you know will get you there quicker. WPF is problematic for me in a number of ways: a) The time it takes to lay out UI takes much much longer than WinForms. I suppose if I wanted to compare apples to apples I could use Canvas for everything and do positional layout which would speed things up but negate some of the advantages of WPF. And b) WPF is very, very complex and there are many inconsistencies and quirks like this one mentioned in this post that make you go WTF were they thinking? These by far are the biggest time sinks sometimes taking hours to resolve or even understand. Additionally it seems like the WPF teams are not good at listening to customer feedback as the pain points that people are running into have not been addressed in 3 years and 2 updates since WPF has been out. WPF is interesting because there's so much that you CAN do with it and so much control you have over the environment, but it's so complex that it takes a long time to understand all the details. Everytime I start with it I find something where I go, man this is so cool and this makes my life so much easier, only to be slapped down by some other feature that's lacking a crucial piece as to be worthless. It's a mixed bag, but the learning curve for me at least has been intense and honestly I can't say that it was worth it... (and I'm not even close to done with my learning curve). Rick - thats a really interesting comparison - thanks. It reminds me so much of other Microsoft initiatives (like Workflow, SQL Compact etc) where their internal lack of corporate product strategy seems to bleed into their products and wastes a lot of our time. It seems a development team get a good idea, they ship it with a load of marketing and architecture blurb, and see whether it works out or not. If it doesn't work out in the market, or another team get a competing and better product out in the real world, its left to die slowly. Perhaps WPF is like that.... I'm willing to bet that the next release of MS Office isn't based on WPF which maybe shows a lack of depth of committment from the big boys in Redmond. I personally always wondered what problem WPF was trying to solve. There are libraries for WinForms (my current one being the Telerik user interface library) which make a decent job of making apps look pretty and are good performance. They might even be using DX under the hood for all I know. I realise the idea of a single portable screen definition language, seperating the logic from the layout, and usable in Silverlight and Windows, is a valid idea; but I think they should have chosen one route to get there, not the two Silverlight + WPF differing routes. Even now I believe WPF not to be completely compatible with Silverlight and porting of interface definitions is still a lowest-common-denominator exercise (though I'm happy to be corrected on that point). What's the SetCulture method implementation? this.Language can be set at the Window level, but Langauge is an invalid object at the app.xaml.as level. This language have to be set per Window, or can it be set per app? Ah, never mind, ignore the comment above. I should read more carefully, and not at 12:30a.m., ;). The FrameworkElement.LanguageProperty statement above works great, thanks for this timely post! I was about to start converting all my stringformat binding statements to valueconverters (which do adhere to currentculture). On a related side note, here's a great little tool makes it really easy to test a compiled app under different culture settings. Even if the next version of office isnt built with WPF, the next version of Visual Studio is being built with it, so there is definitely buy-in from MS into the technology. @Josh only portions of VS will be built on WPF not the whole thing. "Hopefully this will help somebody out by making this issue more readily findable." Yes thanks Rick - First page I went to from Google has saved me considerable time. Forever grateful. Danke, hab ne halbe Stunde rumgesucht bis ich das gefunden habe und gedacht das kann doch nicht wahr sein. I am developing a WPF application where we set the current language at start up time based on an enterprise setting. Then, once a user logs in we check the user setting for language and change the current culture if necessary. If another user later logs in, we may need to change the culture yet again. I was using the FrameworkElement.LanguageProperty... to do this, but changing it failed. Finding this post answered that for me, but now I need to come up with a work around. Anyone have any great ideas? Tks. Thanks Rick for the find with the dateTime & currency format issues. I was digging around your sample on http://wpfguidence.codeplex.com and couldn't find this code on your blog anywhere. After finding your blog and seeing your comment, it all made sense. Where is your SetCulture(culture); and SetTheme(Theme); method? What does it do? Have you implemented them yourself or are they implemented in .NET? It doesn't work with WPF Calendar nor DatePicker. // as the culture, regardless of the system settings. Basically I was getting exceptions on startup because the framework elements (the visual tree?) were not yet instantiated. Dumb, I know, but frustrating. So this is now firing AFTER the app gets going, when the OnStartup event fires, and behaves nicely there. // Creates an instance of the class holding delegate methods that will handle unhandled exceptions. You can see that OnStartup is added to the handlers, some other stuff goes on, then InitializeComponent is called. Alternatively this thing can be called after InitializeComponent but ONLY if InitializeComponent() does not work with any FrameworkElement objects, which is highly unlikely. Thanks for this useful post and thanks Allen for the corrections. I found that, for example if the Resources.resx file contains English texts, there's no need to have a separate Resources.en.resx file. .NET will automatically fall back to the "main" Resources file if the relevant culture-specific file can't be found. I am facing the same issue in a WPF application and i tried the solution mentioned here but it is not working. more details here.